Where Do You Gas Those Things Up? Last week, Cathy and I took the Roadster for a car show and week of island hopping through Washington's San Juan Islands and Vancouver Island in British Columbia. It was a lovely trip and unique in our EV road trip experiences in that we did the entire 450-mile trip using only 120V charging. We are frequently asked where we charge our electric cars. The question is often accompanied by a pained expression that tries to offer sympathy for the sacrifice we make by driving electric. The answer is: mostly at home. People are frequently surprised to learn we have found it to be more convenient than going to a gas station. Occasionally, we take a trip that requires charging on the road. That generally requires planning and finding electric vehicle charging stations. For this trip, there were some charging stations available, but they turned out to be both overpriced and unnecessary. We had chosen B&Bs that would allow us to charge from normal household outlets. On one island this was a big help as there were two otherwise equivalent choices: one that wanted to charge us $20 to use $1.60 worth of electricity and another that said we could do it for free. We gave our business to the one that didn't think we were incapable of doing math. Since we were taking a leisurely tour, and mostly on small islands, overnight charging at 120V was plenty for our daily driving needs. 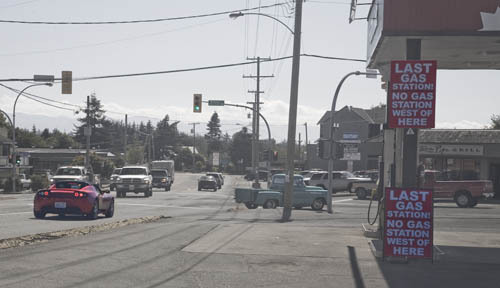 The convenience of being able to fuel up from any outlet became especially apparent when we drove past this gas station in Sooke, BC. We were on our way to Port Renfrew, some 45 miles further west along the southern coast of Vancouver Island. Had we been in a gas car, this would have been our last chance to gas up before our return, some 90 miles for the roundtrip plus any side excursions. Because we were in an electric car, and outlets are far more common than gas stations, we didn't care. 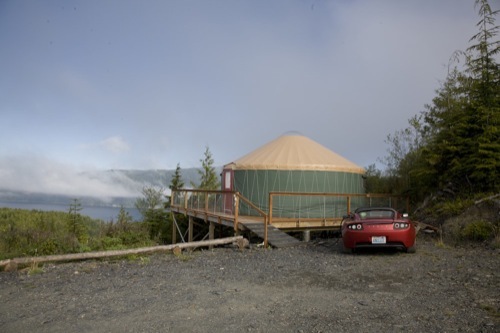 At Port Renfrew, we were going to be staying in a yurt at the Soule Creek Lodge. We'd contacted them in advance and knew they had an outlet we could use to charge the car. Charging at 120V only yields about 3 to 5 miles of range per hour of charging, which is painfully slow if you are waiting while you charge, but totally adequate if you're sleeping through it. Our one night there, we picked up 53 miles of range, which was plenty to get us through the next day's driving. My only regret for the trip was not getting a photo at Wildwood Manor on San Juan Island where we had deer grazing next to our charging car. Somehow you just never see deer grazing at a gas station. 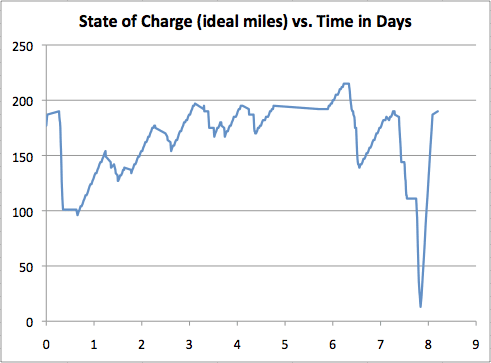 Here's a graph of our state of charge for the trip. It shows the car's range in standard mode ideal miles, which means we can go that many miles at 55 to 60 mph on the highway, with another 25 miles in reserve. The first steep dive is the 90-mile drive to Anacortes, WA, to catch the ferry. Then there's a flat spot while we wait five hours after missing the cut-off for the unexpectedly popular first ferry by 5 minutes. Over the next three nights, we charged up overnight on Lopez and San Juan islands working back to a full standard mode (90%) charge, then a fourth charge returned us to full again. There are also a couple of little afternoon charges in there. The fifth charge is in Victoria, BC, after which the car stayed parked for a full day, then we did a range mode charge prior to departing for Port Renfrew. The overnight at Soule Creek Lodge got us back up to the top of standard mode (about 190 ideal miles). Finally, the long 170-mile drive home with a short stop for lunch then a longer stop for the ferry ride. We got home with 10 miles of range left (thanks to my heavy right foot as it became clear we had plenty of charge), plus the 25 miles in reserve. The last spike shows the steep slope of 240V/32A charging at home. A LEAF could do a pretty similar trip. Depending on the starting point, it might need a little charging on the way to Anacortes (like spending an hour or two at a J1772 charging station at the Burlington outlet malls instead of spending five hours in the ferry line). Instead of spending two nights with a full day in Victoria (where we didn't drive or charge), spend one night in Victoria on the way out and the second night on the way back. Nissan has done a poor job of communicating state of charge to LEAF owners. The first problem with this display is that you can't tell where you are with a simple glance. Quick: how many bars are there? Imagine if only some are lit up, how long does it take to count them? Once you have counted the bars, you have to divide by 12, or multiply by 8.3%. Like I want to do that while I'm driving! There's a nice number there, 93 miles, but the problem is that number varies wildly based on how you've been driving. Your state of charge might be 40% but the range estimate could be 12 miles if you just reached the top of 4,000-foot pass, or it might be 80 miles if you have been descending from that same pass. Likewise for just getting off of a stretch of 75 mph freeway versus getting onto the freeway after a stretch of 45 mph urban thoroughfare. Drivers need to know what's in the battery unfiltered by a rating on their recent driving. This isn't just my opinion, or the opinion of a few old school EV fanatics. I keep hearing from new LEAF owners who after a few weeks of driving realize that the estimated remaining miles on the LEAF dash is not useful. It's not that Nissan did it badly, or that it can be fixed by improving their software, it's not what EV drivers need. Ford is coming out with the Ford Focus Electric this year and is apparently asking for opinions on what drivers want to see on the dashboard. First off, Ford should be asking what gas car drivers want to see and putting that in their ads, but they should be asking what experienced EV drivers want to see and put that on the dash. Ford should start with dropping a line to the folks at Plug In America. When I'm driving, I don't want to see animations or flashy graphics in my main field of view. I'm not watching a movie, I don't need special effects, and I definitely don't need running commentary on my driving. The LAST thing I want to see on the dash is any mention of gasoline. Did the Model T need a gauge showing how many bales of hay had been saved? Please don't let some gas-driving marketing intern design the dash for an electric vehicle based on talking to other people who haven't owned an electric vehicle. My wife and I have been driving electric for three years and have logged over 38,000 electric miles. We've done lots of local driving and enough road trips beyond our single charge range that we know what we need. Speed, preferably numerical, very easy to read at a glance, the biggest number on the screen. 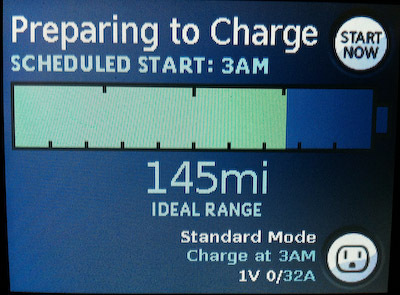 After speed, the single most important information an EV driver needs is the state of charge, SOC. This should be conveyed as remaining charge energy, in numerical resolution comparable to a mile's worth of driving, and not mangled by some unknown function of my recent driving and road conditions. Instantaneous energy use. This should be graphical and clearly show whether I'm using or generating energy and how much, even when it's a small amount. Having a number would be nice, but not necessary. Trip meter, preferably selectable from several. Having a trip meter that automatically resets after each full charge would be cool, but we still want user-controlled trip meters. Estimated miles remaining based on recent driving is rarely useful, but it would probably be weird to not have it available. Most people think that will be useful until they get used to driving electric. Not having it would be a distracting omission for new owners. It can be on the dash, even on by default, but there should be a way to get rid of it, perhaps making it an alternate to an absolute remaining energy number. 1) Do I have enough energy to make it to my destination? 2) If the answer to #1 is "maybe", how do I need to moderate my driving to make it? Most of the time the answer to #1 is an unconditional "yes". An answer of "no" means it's time to find charging, a condition that should be rare if the car is being used for local driving as intended. If the answer to #1 is "maybe", then I need the best information possible to answer #2. Note that an estimated range is always wrong when it matters because it assumes my driving style and road conditions are going to remain constant. It's basically telling me how I have been driving. I don't care about that. I need the information that will make it clear how I need to be driving for the rest of my trip. For this reason, the choice of energy unit for the SOC display is critical. I want something more convenient than kWh, something that will not require doing math to interpret the number. If a vehicle has a certain stated nominal range, which corresponds to X Wh per mile (battery-to-wheel), then the ideal energy unit is X Wh. Tesla calls this an "ideal range mile." Call it whatever you like, but it's a very convenient unit of energy as it tells me how much is in the battery and gives me a range goal I can generally meet or even exceed if I need to. If a car has a nominal range of 100 miles, then SOC percent corresponds to one mile of nominal driving. That's cool, but it doesn't generalize very well. When next year's model has a range of 140 miles, I don't want to have to multiply SOC percent by 1.4 to get nominal miles. Showing SOC as kWh is even worse. Not only do I have to multiply by some goofy factor, it's a different factor for every car depending on weight and aerodynamics. Showing kWh used as part of a trip meter is awesome, and showing SOC in kWh has a certain appealing geek factor, but I don't want that to be my best-resolution SOC unit. We'll all be better off if the car companies start showing SOC as nominal miles now. On the Roadster, an "ideal range mile" is the amount of energy needed to drive one mile on the combined EPA driving cycle and corresponds to driving level highway at about 57 mph in moderate weather. Knowing this number and my miles to destination tells me how I need to drive to make it. This number slowly ticks down as I drive (occasionally ticking up on a long downhill drive), it doesn't fluctuate wildly as I go up and down shallow slopes and small hills. 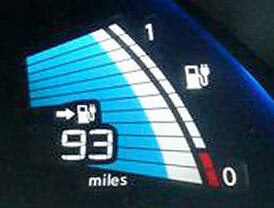 Nominal miles yields a much more reliable idea of remaining charge than an estimated-miles number can. Having this number enables useful discussions about range and energy use among owners. If someone is planning a trip over the pass from Bellevue to Ellensburg, I can say that I've done that several times: traveling the ~100 miles over the 3,000-foot pass at 60 mph in moderate weather used 113 ideal miles and closer to the 70 mph speed limit used 119. It also makes planning for elevation possible. Every 1,000 feet of climbing uses up about 7 miles of nominal range, and going downhill gives about half of that back. Knowing that simple approximation makes it possible for a driver to plan a trip over a mountain pass just by knowing the required distance and elevation change. If other automakers use the appropriate nominal mile energy unit, these conversations will work across different makes and models, allowing drivers to share approximate energy expectations without a lot of goofy conversion math. That probably sounds complicated. Just remember, electric vehicles are intended for local driving within their single-charge range. Most of the time the answer to the "do I have enough charge" is "yes, of course you do." It's only for the rare long trip that figuring things out is needed. Having good state of charge information available all the time will allow new drivers to develop experience and insight from their easy local driving that will make it possible for them to figure out which longer trips are practical. 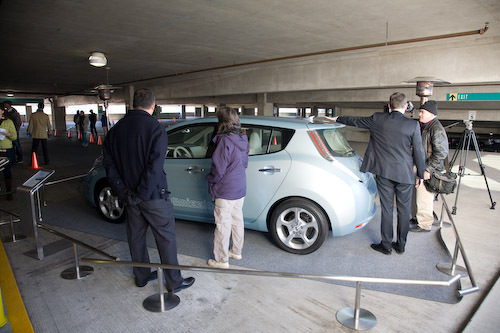 It's critical to widespread electric vehicle adoption that automakers get it right. For the month of November, I drove the Roadster 762.2 miles. That's mostly with just me in the car driving a variety of city and highway miles. I tend to drive enthusiastically most of the time, but the month also included a roundtrip drive to Longview, WA on cruise control at 55 mph. During the month, I put about 247.8 kWh into the car from the wall (213.3 kWh metered from my garage plus approximately 34.5 kWh from an unmetered NEMA 14-50 outlet in Longview). That's 325.1 Wh/mi and includes charging losses, battery pack self discharge, heater, headlights, etc. That's my wall-to-wheel number and is based completely on things I can measure. From July 25th to August 27th, I drove the Roadster 696 miles and pulled 234 kilowatt hours (kWh) from the grid, giving us 336 Wh/mi. That included some hot weather and four 1/4 mile runs at Pacific Raceways. On individual charges, I see efficiency vary from 240 Wh/mi to over 400 Wh/mi, and obviously much higher for things like drag racing. I charge consistently at 240V and 40A at home. In Longview it was 230V and 40A. Because of charging overhead, I assume I would get slightly better charging efficiency if I charged at home at 70A. So, my numbers are just that, my numbers. Another driver would get different numbers depending on driving, weather, road conditions, and charging habits. The EPA estimates documented in the paperwork for our car say 260 Wh/mi city and 290 Wh/mi highway. I've seen information from early 2008 Roadsters that had the EPA numbers and 340 and 360 Wh/mi. You may have heard Roadster owners talk about numbers well below my 330 Wh/mi numbers. These are most often the number reported by the car's info screen which are not wall-to-wheel numbers, and in fact are (as far as I know) not at all documented as to what that number means. I have figured out some things about the numbers reported by the car, which I'll now explain. For the month of November, the Roadster's trip meter says that I used 207.9 kWh, and thus 272.8 Wh/mi. But what does that mean? Did I push 207.9 kWh into the motor, or is that net of energy pushed back into the pack from regenerative braking (regen)? Does it include energy used to run the accessories and/or running the coolant pump and fans during charging? On the "Energy History" screen, the Roadster tells me my "net energy used" for the month was 233 kWh and that I got 26 kWh from regen. What does "net" mean? I would assume that "net" means "net of regen," i.e., power from battery pack minus power into battery pack from regen. Except, if I compare those numbers to what the trip meter says, I notice that 233 - 26 = 207, which is suspiciously close to the energy use number reported on the trip meter. From that, I infer that the trip meter's number is net energy use from the battery pack (power drawn minus regen put back in), and thus the so-called "net energy" from the energy use screen is really the gross energy pulled from the battery pack including energy that went into the pack from both wall charging and regen charging. Do these numbers include the energy spent on accessories? Is the difference between what I put in through charging (247.8 kWh) and the car's reported net energy use (207.9 kWh) just charging losses or does that also include accessory use? I have no idea. The only number I can stand behind, and the only number I can compare with other electric vehicles, is the wall-to-wheel number. The efficiency number reported on various of the Roadster's info screens is useful for understanding how driving style and conditions affect efficiency and for predicting/optimizing range, but is seemingly useless in any other context. 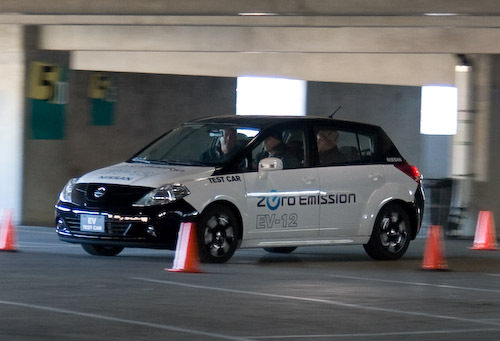 I believe the same is true of any efficiency number for the Leaf given out by Nissan, or any other EV manufacturer or driver, unless that number is as clearly defined and directly measured as the wall-to-wheel number. It used to be that the Tesla screen reported an energy number after each charge that was much lower that what was actually drawn from the wall. I suspect that was the energy that actually made it into the battery pack, but I never saw it defined by Tesla. More recent firmware versions are reporting a number that is close to the number I read from the wall meter (and averaging multiple consecutive readings together agrees to within 1% of the wall reading). This is a big step forward for drivers who want to monitor their actual wall-to-wheel energy use and efficiency, but don't want to go to the expense of installing a dedicated meter. It would be a real benefit to the Tesla community if Tesla would (a) define the number they currently report and (b) make the energy drawn from the wall across multiple charges easily available. Regarding range on a single charge, my personal record is 192 miles driven with a passenger in 100+ degree weather starting with a bit less than a full charge and ending with 10 miles of range left. On the trip back from Longview in cool weather, I drove 136.9 miles using cruise control at 55 mph using 55% of the battery. To the extent that you can extrapolate that to the full battery, that figures out to about 249 miles of range. On the trip down to Longview earlier the same day, also using cruise control at 55 mph, it was raining and colder, so I had the wipers, headlights and heater on and used 65% of the battery pack, for an extrapolated range of 208 miles. My car is a 2008 Tesla Roadster with firmware version "3.4.15 15" (upgraded from "3.4.13 15" on 11/15/2009). Edited at 10:23 pm on 12/13 to correct typo in second paragraph. Today, Cathy and I both got to drive the Nissan Leaf test vehicle, apparently a Nissan Versa outfitted with the Leaf's drivetrain. Coincidentally, last week we rented a Versa on vacation, so we were treated to a virtual side-by-side test of gas versus electric. They had a course laid out with cones in a parking lot, which I treated as a small autocross course. The test vehicle handled well and had good pick-up, better than the gas-burning Versa. Most interesting was how quiet it was. The Roadster has a loud gearbox whine when accelerating, plus road and wind noise. The whine is much quieter than a gas engine doing similar acceleration, but it's not silent. The RAV4-EV has a comparable road noise level, maybe a few dB below the Roadster and minus the loud drivetrain whine. Both the Roadster and RAV4-EV are about 7 to 8 dB noisier than Cathy's parents' Honda Accord doing 60 mph on the same section of average freeway surface. (We measured all three vehicles with a Radio Shack sound level meter.) 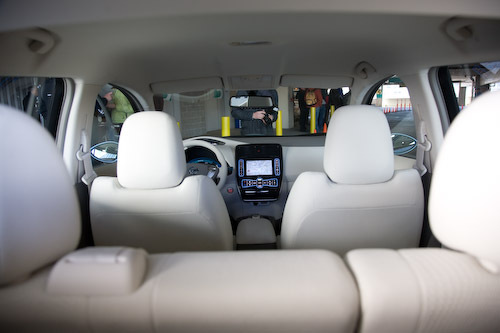 The Nissan test vehicle was very quiet from the inside, I think quieter than the Accord, but we didn't do any measurements. From the outside, you hear the same tire sound you hear from any decent modern sedan. Before buying, I'd want to take it for a real test drive, get it up to speed on the freeway, etc. That said, based on our test drive today, I'd highly recommend it to anyone who is an early adopter, very interested in driving an all-electric family sedan, and whose driving habits could be met by the Leaf's range. That assumes that Nissan doesn't bungle the whole thing by forcing buyers into some ludicrous over-priced battery lease.